The port of Lewisporte, Newfoundland is pretty busy these days with the ferry Sir Robert Bond and coastal ferry Northern Ranger, the tankers Nanny, Dorsch, Tuvaq and Mokami spending the winter. Lewisporte was always busy when the ferry service was operated by Marine Atlantic, with chartered coastal freighters, like the Marine Transport, Kloster, Terra Nova, Topsail, and Duke of Topsailand Astron. Then there were the ships owned by Marine Atlantic, like the Taverner, Hopedale, Petite Forte, Marine Packer, Sir Robert Bond, Ambrose Shea, Atlantic Freighter and Northern Ranger..and there were lots of other ships prior to that like the Kyle, Nonia....before my time. 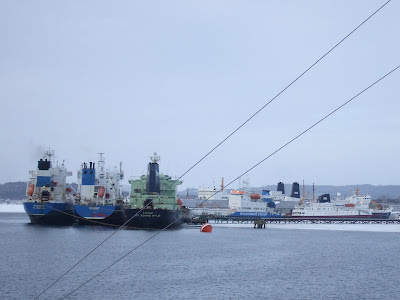 Over the last number of years there are not as many ships operating due to the fact a road is being built, and the handover of the service from Marine Atlantic to the Newfoundland Government in 1998. In 2011 brings a new ship to this service, the Dutch Runner, with a stern ramp and two cranes, this ship should work well, but only time will tell.